By looking at the title, you might have understood that it is about six profitable ways of indulging 4.5 x 6.75 magnets in brand marketing. Before listing the profitable ways of using them, let us try to understand why magnet advertising is becoming a choice for branding. Over the years, you might have understood that promotional magnets are grabbing headlines and marketers are largely seeking it for building a large impact on the niche where they are operating. Do you know what is special about marketing your brand through advertising magnets? Perhaps the creative edge that they offer at extremely low pricing! You do not have to think twice about the choice of colors for presenting your thoughts because free full color printing is a value added feature of magnet advertising. Now coming to the point – how you can derive benefits from advertising over 4.5 x 6.75 magnets. Indeed calendar magnets are the least risky and effective promotional item that you can build from a 4.5 x 6.75 magnet! Although people may receive promotional calendars from various businesses, but they would easily always love to grab one for their refrigerator door. The kitchen is the busiest place in the home and a person goes near the refrigerator door at least 10 times in a day. Calendar magnets are sure to buy attention more attention than the regular promotional magnet due to the information printed on them. By making this investment, you are sure to enjoy 365 days of non-stop branding with your advertising fee dropping to lesser than a cent/ day. Menu magnets are one of the most effective promotional items and food marketers seeking them for buying favorable responses for their food business. 4.5 x 6.75 menu magnets highlighting the special dishes (if you are a food marketer) are largely preferred by food marketers for value building. You can make them impressive and visually sumptuous by choice of images. People would happily retain attractive customized menu magnets over their refrigerator doors as long as they can. It will become their savior in the time of need. Everyone loves to save money during purchases. Customers love receiving discount coupons because they allow them to save on their favorite purchases. You can easily score a point with your customers by gifting them customized discount coupon magnets. People would treasure them as a memoir and a refrigerator art as long as they can. Rack cards are always tradeshow favorites and they are preferred by businesses of all sizes for building impressions. This time, you can get smarter by investing in magnetic rack cards. You can use them in the best possible way to produce a favorable review about your company or brand. People always love greetings and holiday wishes because they remind them of the special relationship that they enjoy with the giver. Perhaps you can easily become a customer favorite by gifting them a holiday wishes magnets designed over large 4.5 x 6.75 magnets. Sales flyers are sought by businesses trying to popularize their sales events with minimum efforts. 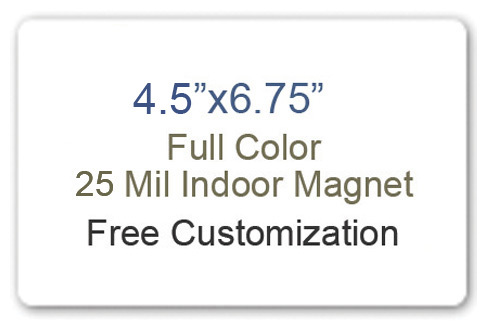 However, this time you can try it different by indulging 6.75 x 4.5 magnets with sales information in typical format. You can enjoy many more benefits by indulging these customized magnets in the way you want. Remember, only creativity is the key to make your business information stand out in the competition of brands.